After 14 years at Jones Bay Wharf, Flying Fish moved to its new premises at The Star. There's a new chef, new look and new food. So what is the new Flying Fish like? 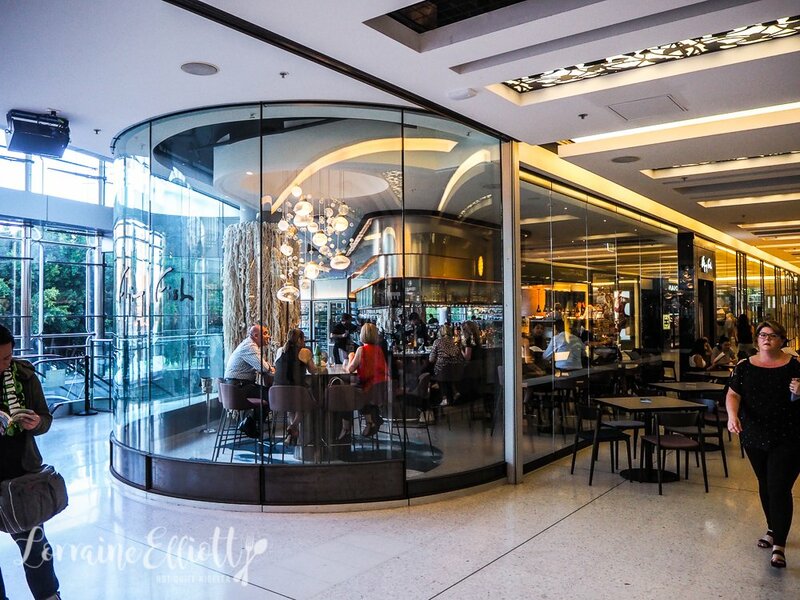 Within the whole The Star casino complex, Flying Fish takes the place of Balla just near the Lyric Theatre. When you walk in there is an open kitchen with displays of lobster, caviar on ice and perfectly cut fish fillets. The bar is on the left while the main restaurant area in on the right. The Executive Chef Peter Robertson is formerly of Rockpool, Eleven Bridge and Jade Temple. 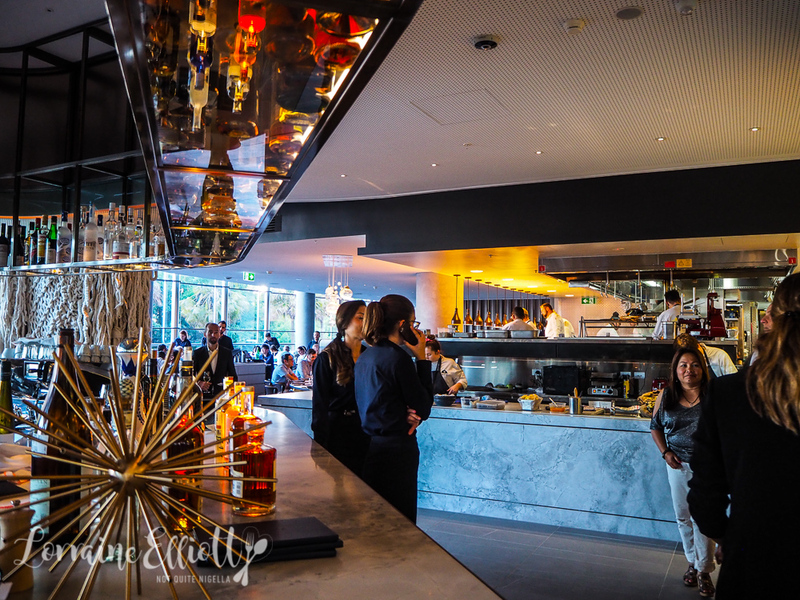 Comparison is inevitable between the two restaurants and admittedly the former location at Jones Bay wharf was one of my favourites and it's hard to beat that heritage wharf beauty, especially with a modern building like The Star. I spent more nights at the old Flying Fish bar sipping cocktails and watching that sublime direct water view than I can remember. For me, the former location was the place for a romantic dinner while the atmosphere here seems more like the place to do a business deal. The theme by designer Paul Kelly is mixed metallics and silver grey and hand blown caviar shaped lighting. This post is actually a combination of two visits: a visit to the bar one night as well as a lunch a week after. Mr NQN and I were seeing Book of Mormon and decided to try out the new Flying Fish. It was early so it was easy to get a seat although the prime high tables by the window with the water view are taken. 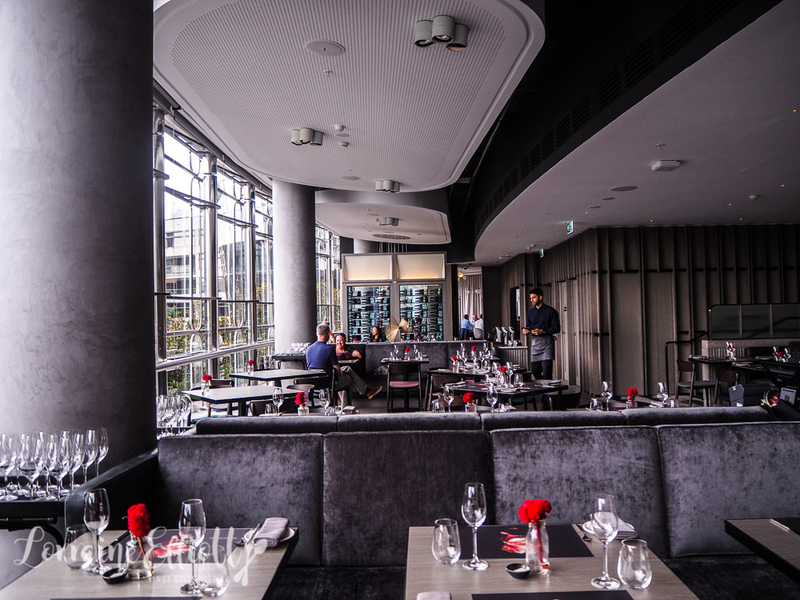 The bar menu has a good range of offerings with caviar, oysters and finger sandwiches as well as larger pasta or meat based mains. We start with one each of the finger sandwiches. 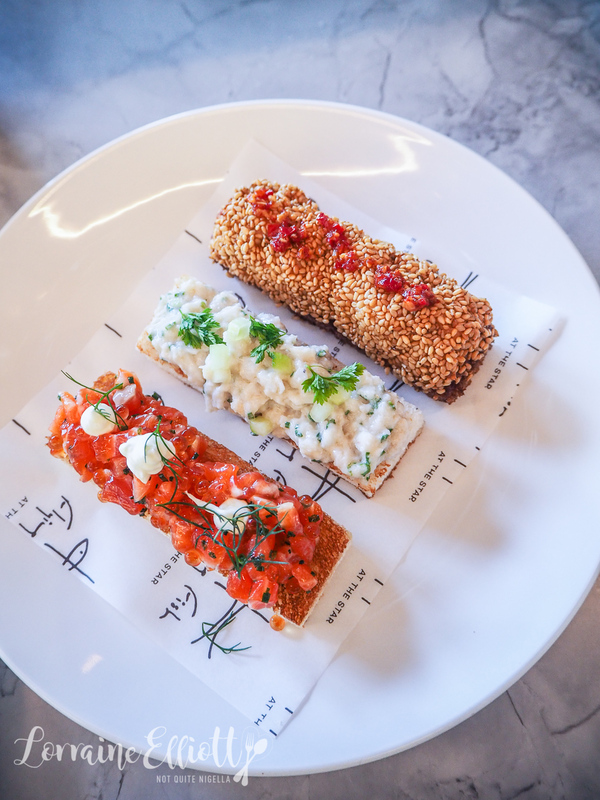 There's one with ocean trout, roe and crème fraîche which is nice but my favourite two are the prawn toast, a deep fried toast finger with Spencer Gulf prawns and "fish fragrance" or if you're looking for something a bit lighter, try the divine spanner crab finger sandwich with mayonnaise and chives. 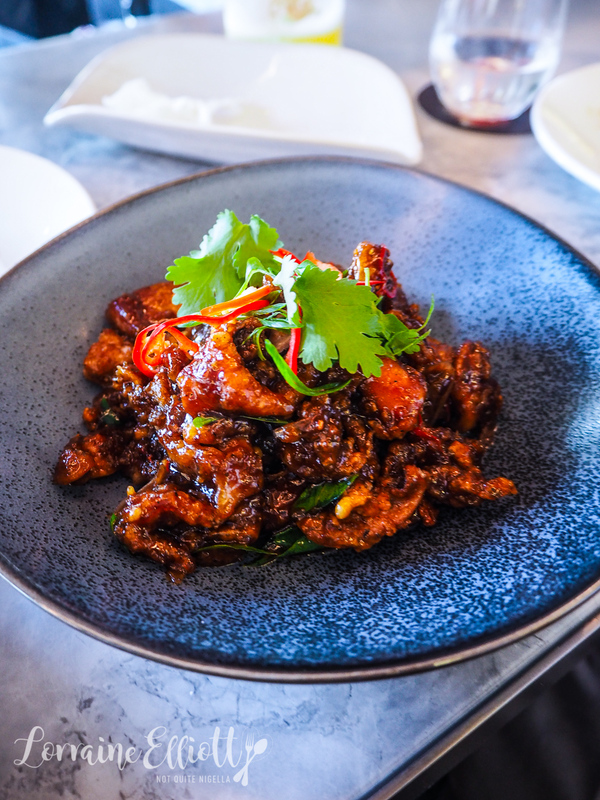 The fish fragrance is a chilli condiment found in Szechuan cooking that doesn't contain fish but adds sweet, sour and spicy flavours to seafood. Peter says, "Ours includes brined chilli, which has been steeped for two weeks in salted water to soften the heat of the chilli. We then add oil, ginger, garlic, black vinegar, sugar and salt." The deal is that I order and Mr NQN eats (well so do I) and everything ends up fine. But this was Mr NQN's order and it was the dish that didn't really wow either of us. I feel like there was an element missing, like a fresh or piquant element to this. My favourite dish of the bar menu apart from the finger sandwiches is the pork and squid black pepper stir fry. The pork is jelly soft and melting and the squid tender and all of this is blanketed in an intensely rich and slightly sweet black pepper sauce. I think I greedily ate most of this. The only issue? This should have probably come with rice to mop up the sauce and to balance this as it's very intense (there wasn't rice on the bar menu so I assumed it came with some). It's one week later that I find myself returning to Flying Fish. This time I'm with Louise and baby Henry. We are seated in the main dining room. 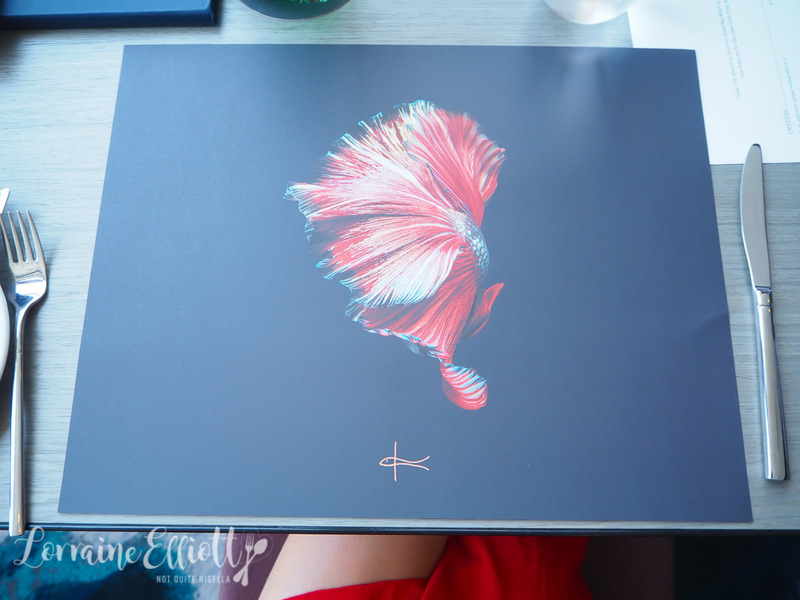 The menu now sits on the table as a double sided paper menu while the drinks are in a compendium. 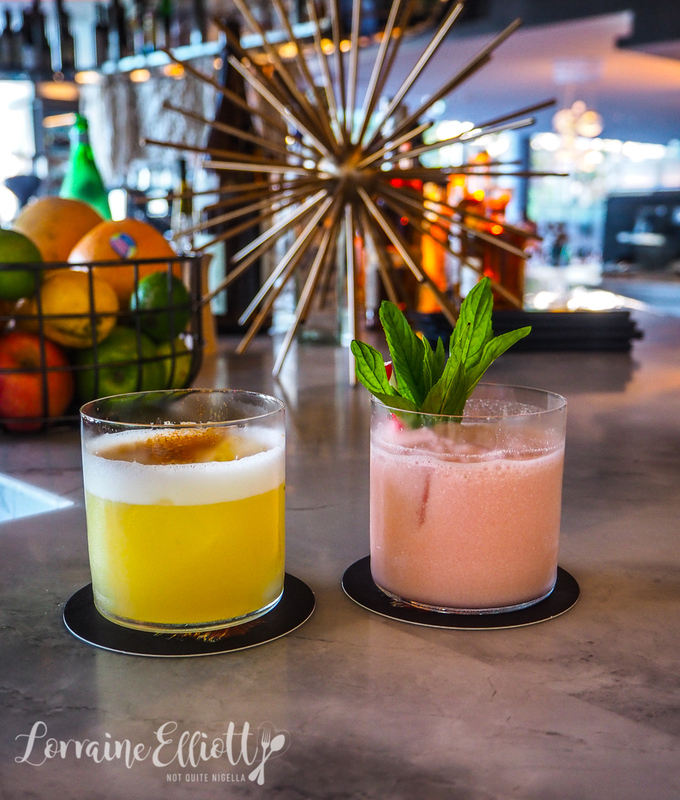 Drinks come first and it's a Kampai Pyrmont for me. 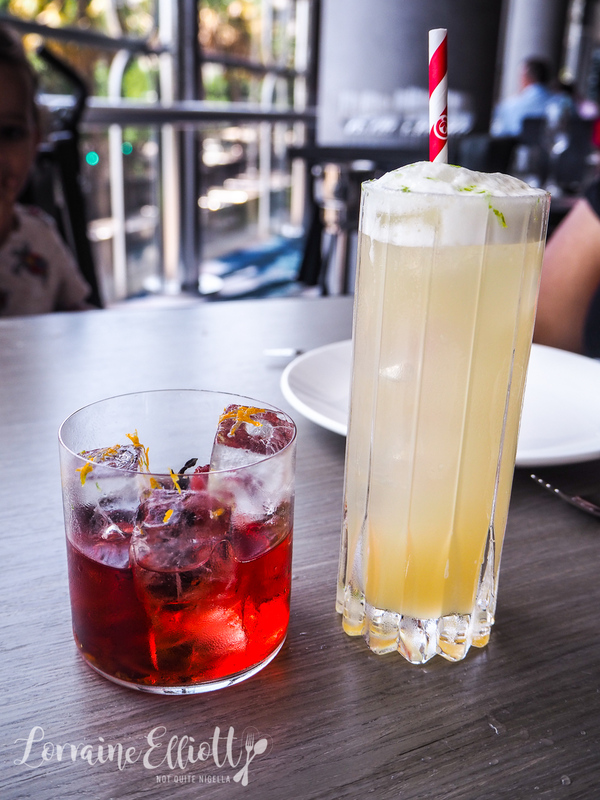 It is a delicious sake highball with pineapple and yuzu honey soda and a Behz-ness As Usual for Louise with Poor Tom's strawberry gin, Campari and Australian vermouth. 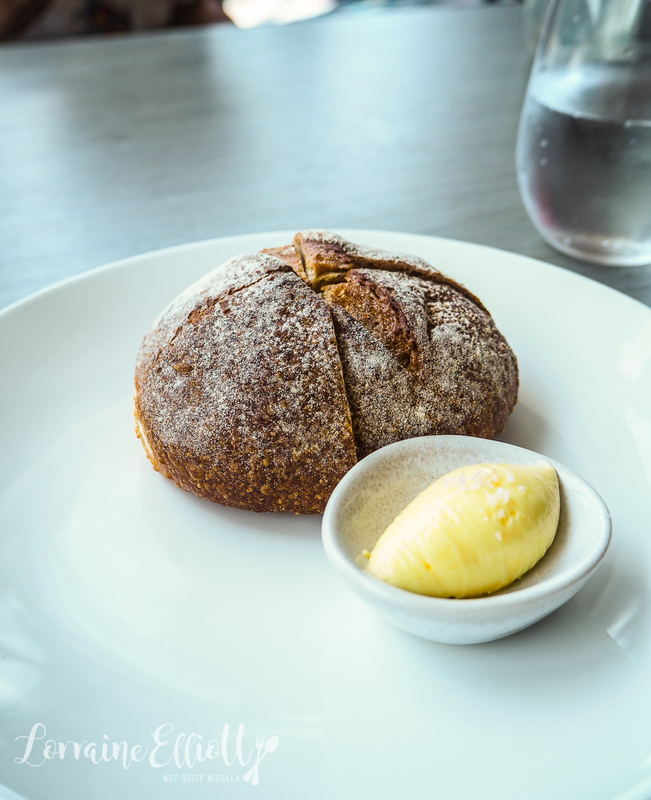 They bring out a boule of rye sourdough with cultured, salted butter. I also can't resist ordering another serve of the spanner crab toasts because they were so delicious last time. Oddly enough, they take away the bread after this even though we hadn't finished it. We also try the fish sandwich from the bar menu. 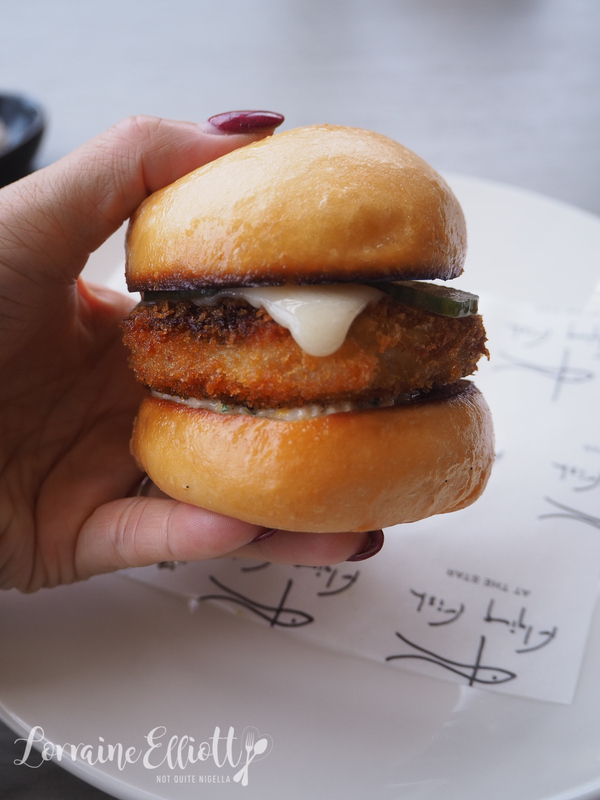 It is a golden crumbed snapper fillet on a golden, toasted soft bun with sauce gribiche, melted cheese, slices of pickle and a touch of ginger. 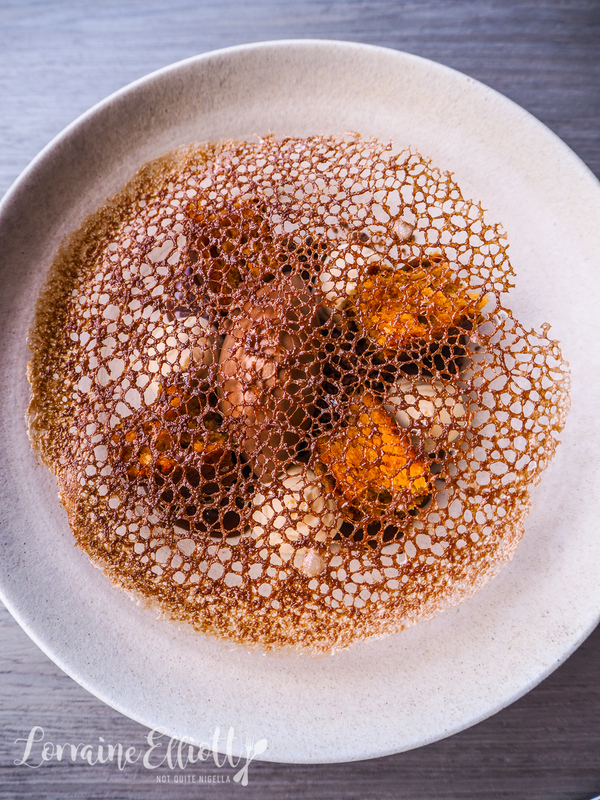 This dish is also on the bar menu and I almost ordered it on the last visit. It's cavatelli pasta, a small ridged shell shape made of semolina dough paired with shelled Moreton Bay bug meat and mandarin kosho, a Japanese condiment usually made with chilli, salt and yuzu but in this case it's mandarin. The citrus is actually quite light in this one. 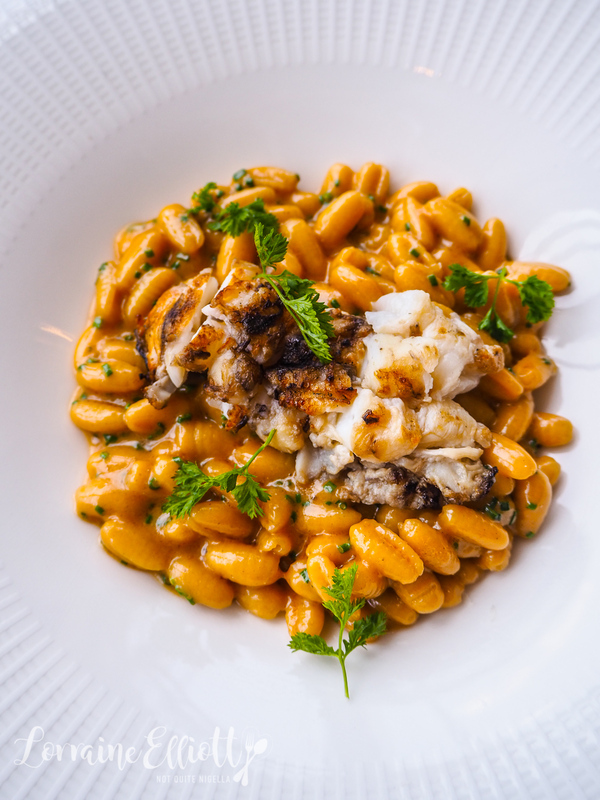 The texture of the cavatelli is the main feature of this dish. 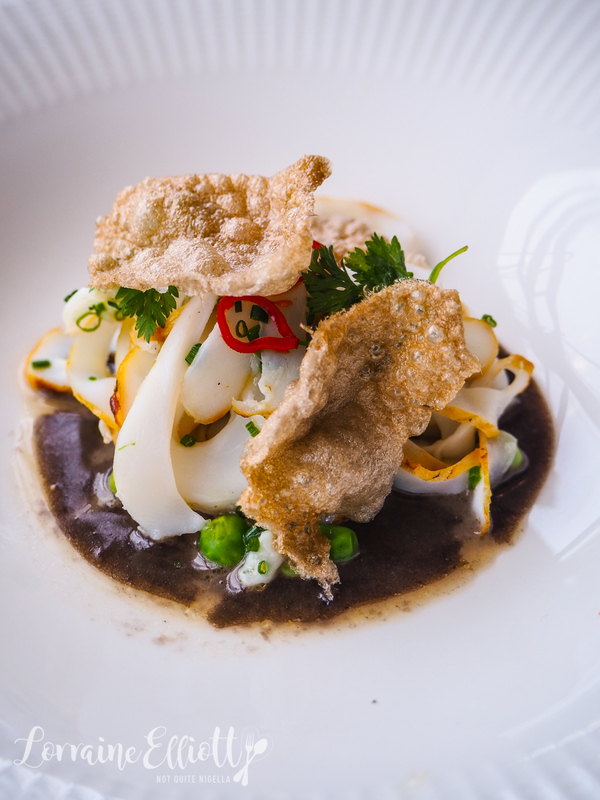 The grilled Southern calamari is served as paper thin ribbon-like noodles on a bed of squid ink butter and broad beans. Peter describes the dish, "Squid has a nice sweetness which is brought out by the smoke of the barbecue. We get Southern Calamari from Port Lincoln and use all of it in the dish. First we take the ink to make the squid butter, which is prepared with eschallots, butter, garlic and port and then reduced. The calamari is then barbecued, sliced and dressed with lemon juice, olive oil, chives and chilli. 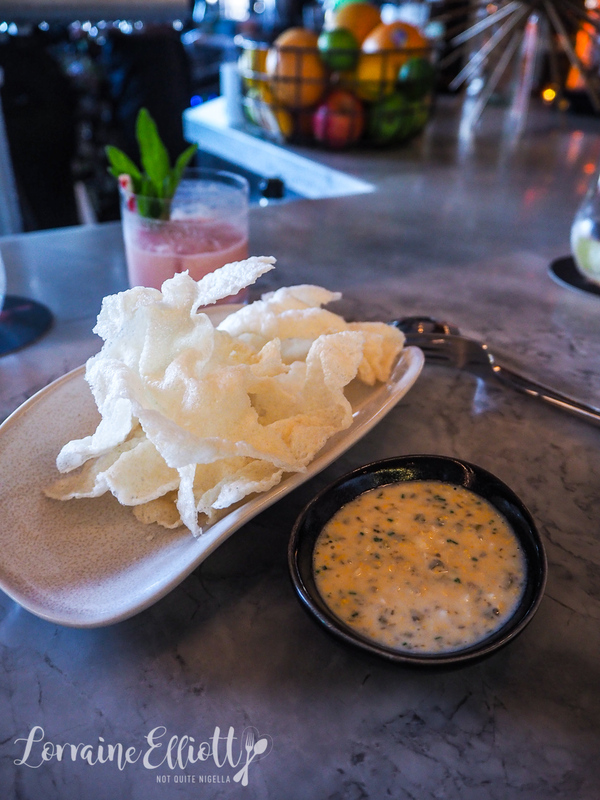 We serve it with a tapioca cracker made from the trim of the wings so nothing gets wasted." Our two mains come out next. We both note that prices are fairly high for mains here (they range from $35 for the vegetarian to $58) although they do deliver in flavour. The mains are two fish dishes but with two very different flavours. 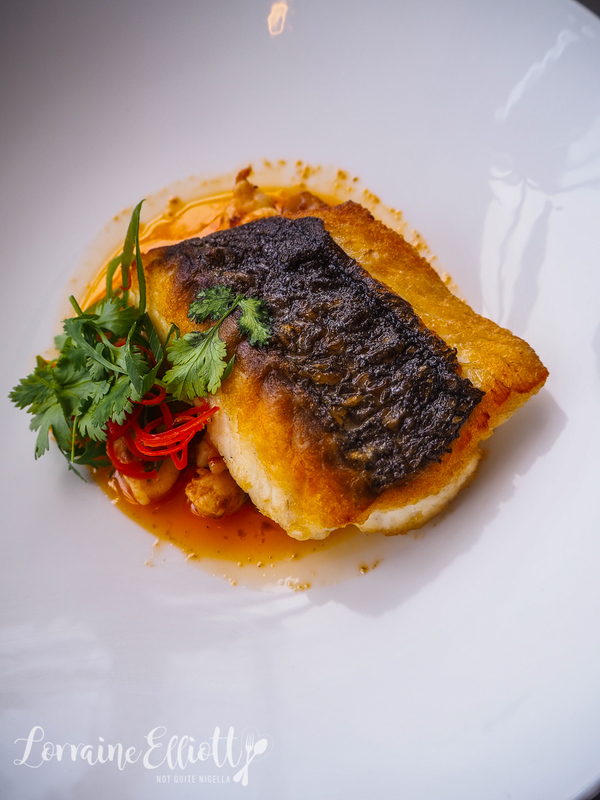 The first is a snapper with a miso pumpkin puree, chopped prawns, peas and dark roasted macadamias. The miso pumpkin puree is sweet and given complexity from the miso. 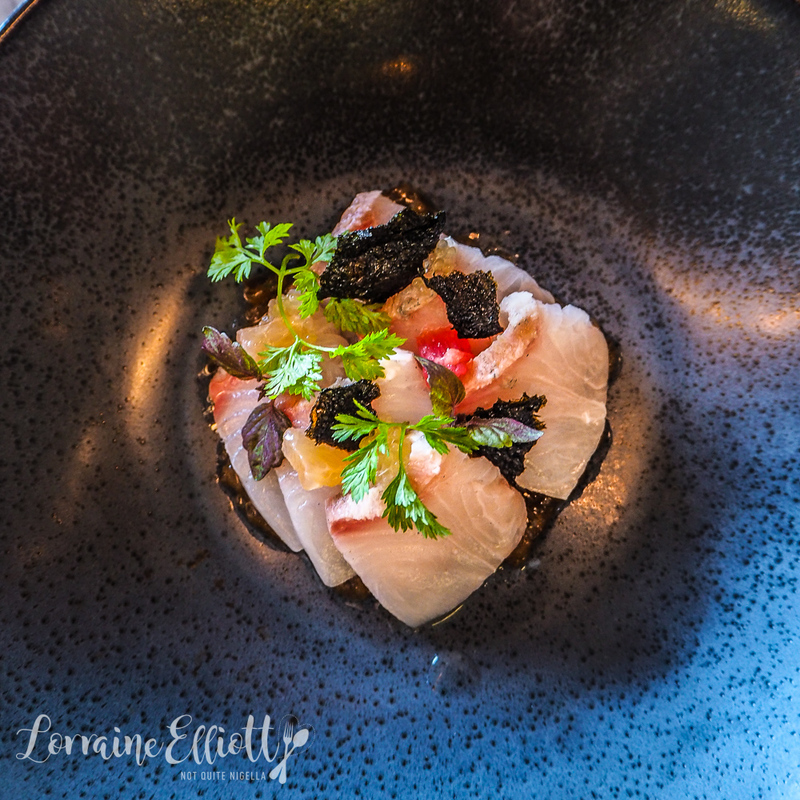 I always get excited when I see Murray Cod on the menu as it's one of my favourite fish with its large flakes and luscious meat. This is both of our favourite main, the skin beautifully crispy and well seasoned. It is paired with jamon cream, asparagus and a fig leaf oil. We get to try all the desserts which makes for a pretty wonderful Friday afternoon. 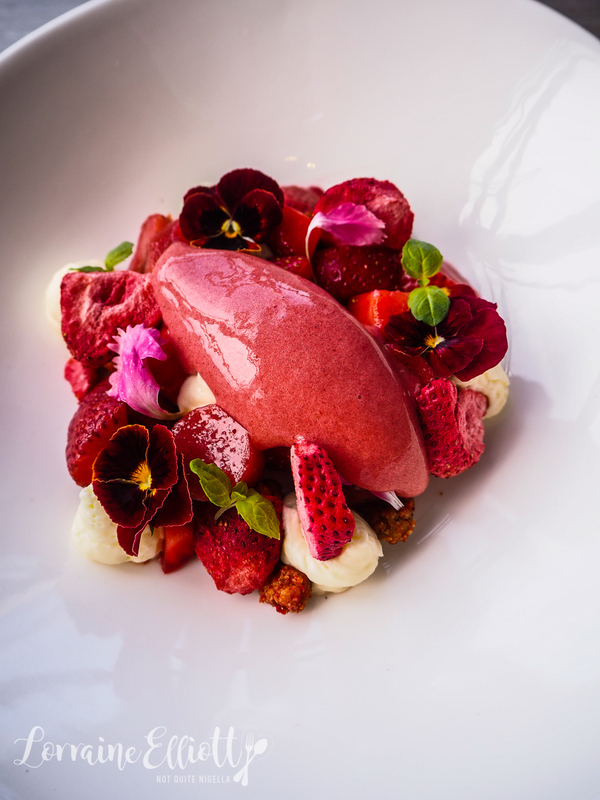 There's a range of textures and treatments of strawberry in this dessert. There's freeze dried, fresh, ice cream and poached strawberries as well as dabs of cultured cream and Moscato and a toasted granola. The charred lemon parfait is like a lemon cheesecake with a good level of tartness to the creamy, light parfait. It sits on a bed of salted butter nutty crumbs and there are thin pieces of toasted meringue (although these do stick a little to the teeth). Both Louise and I really liked the sound of this tropical sounding dessert. 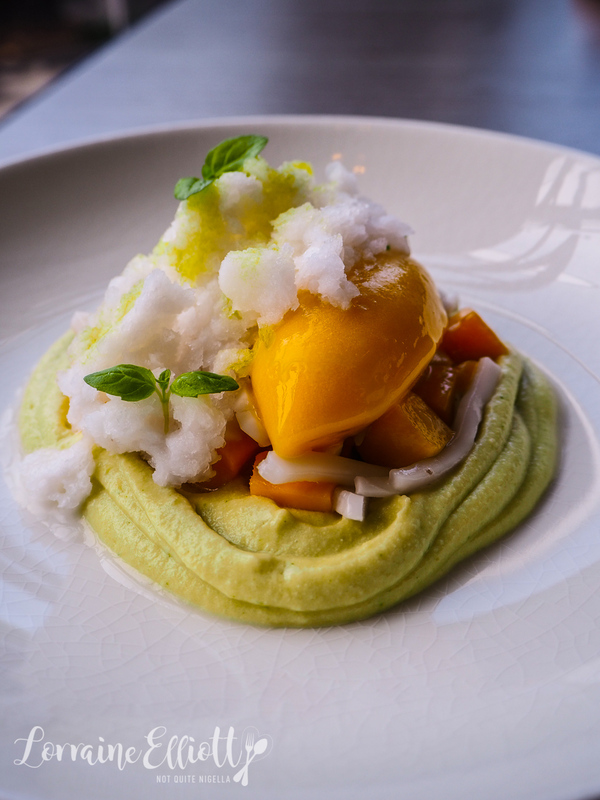 It has diced mango, mango ice cream, coconut ice granita, fresh coconut strips and pandan cream. The pandan cream is a touch grainy in texture but if it weren't I think this would have been our favourite dessert. But I saved my favourite dessert til last though. I usually don't go for chocolate desserts after a big meal as they can be too heavy but the textures and the miso caramel balance the rich chocolate perfectly. 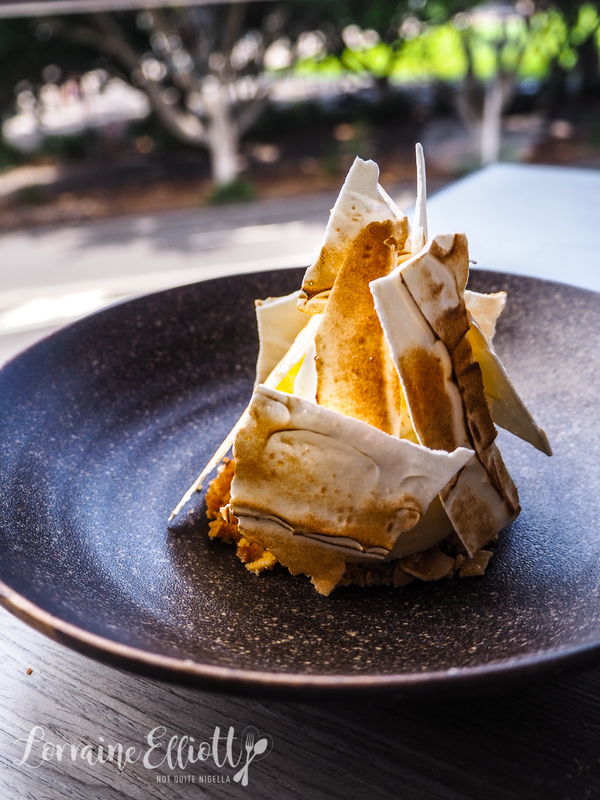 There's a malted barley pound cake, malt cream using cultured cream from Pepe Saya, miso caramel, chocolate sorbet, chocolate malt ganache and soil all under a lacy tuile made from cocoa nibs. Peter describes it as a "grown up Milo cake" although it has to be said that baby Henry also enjoyed this. So tell me Dear Reader, have you ever been to Flying Fish? If a favourite restaurant of yours moves, do you go with it? 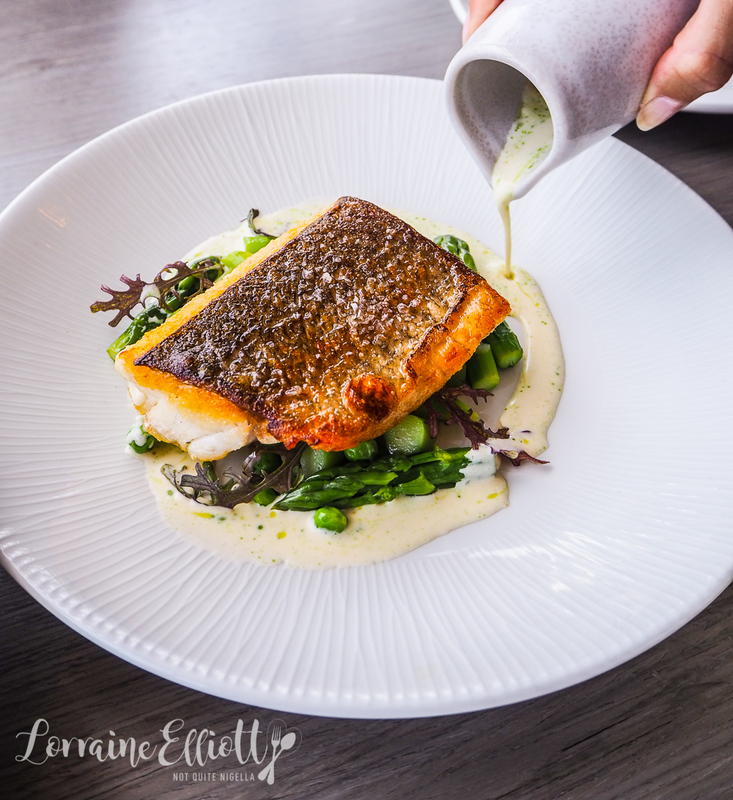 Do you have a favourite fish that you always tend to order when you see it on the menu? The bar meal was independently paid for, the lunch was as a guest of Flying Fish.